Posted on February 28, 2015 March 1, 2015 . by Patrick Johnstone. Leave a comment. The People might have noticed we didn’t have a Regular Council Meeting on February 16th. Instead, Council spend a bunch of time workshopping various topics as aCommittee of the Whole, both in open and closed session. You can watch the open portion online here. This week, there was an interesting set of Delegations on the future of the Waterfront Parkade, but that is part of a bigger discussion I will cover in another post. The new Rexall Drugs want to add a couple of direction-finding signs to their free underground parking. Frankly, I was a little bothered that they had already installed these signs, and were asking for a variance now, but it appears there was a lack of understanding about the need for a variance, and the signs they are putting up will replace the ones they already have and will be less obtrusive (more neutral colour and non-branded), so I got past the oversight. We received a bit of correspondence opposed to this variance from residential neighbours, but it appears they were mostly opposed to the existing lit signs on the buildings, which were approved without a variance back when the building was approved. I agree they are a little big and perhaps brighter than ideal, but it would be difficult for the City to go back and force the removal of a legally-installed sign. The new signs covered by this variance are not lit, so they at least won’t make the situation worse. We received no correspondence or delegations on this variance. Save-on-Foods want to add a sign to the side of their building so people on Royal Avenue are aware that they are driving by the back of a Save-on-Foods, which seems like a reasonable request. The Terms of Reference for the Mayor’s Public Engagement Task Force (of which I am a member) was expanded to put yet more public on it. There were many great applicants, and we had to work hard to winnow it down to what we feel are 6 unique voices who each bring something different to the table. I look forward to working with Jen, Chinu, Daniel, Nadine, Gabriella, and Nancy. Annual updates of the Financial Plan continue, and I suspect as the public process goes on, I will be writing several blog posts about it. There were two votes Council took at the Committee of the Whole that were interesting (for a Mayor and Council that ran as a team this recent election) in that they both went down to 4-3 votes in Committee in the Whole. I think that is great sign that we are not being myopic as a Council, but are having meaningful discussions on important topics like the budget. Council decided to save a bit of money by reducing the requested increase in Parks Labourer positions by 50%). I voted against this, as I felt Parks made an effective case for an increase seasonal staff to meet the demands that increasing green space in the City places on current crews. More people on Council agreed that the department should dig deeper for internal efficiencies to make this happen. Another interesting discussion ensued around a request to allocate the “bonus money” we receive from digital sign revenues in accordance with the way we spend the baseline revenues. This is a bit complicated, but short version is that the City receives about $1,000,000 in base revenue from the digital signs that were installed last year, and Council made a policy decision when the signs were installed to split that base revenue into 50% for the fund to finance Canada Games Pool replacement, 40% for the Massey Theatre replacement project fund, and 10% into our Affordable Housing initiative fund. The signs are performing better than anticipated, so we expect about $400,000 in “bonus revenue” in 2015. Council has not established a policy on how these bonus revenues are used. It was proposed this year that we use that bonus money to offset some of the tax money we had already earmarked for the Canada Games Pool fund – which means we could take about $400,000 off of your annual tax bill and not short-change the capital planning for Canada Games Pool. Councillor McEvoy argued that not all of the bonus money should go to the CGP fund, but that 10% should go to our Affordable Housing reserve, as per council policy for the base funds. I disagreed, as did two of my council colleagues, but it takes 4 to win a vote. During the last two Committees of the Whole, we have reviewed recommended changes to the Capital Plan that will move parts of the money into the 2016 budget. Short version here is that the City has both long-term capital plans (to schedule and finance the building and operation of City assets, from swimming pools to sidewalks to computers), and we have short-term capital needs. The money available to us (through your taxes, transfers from other governments, drawing from reserves, through cost-recovery, debt financing, etc.) for these items needs to be managed over a multi-year planning cycle. As a housekeeping measure mostly, the City moved many items from this fiscal year into the years when the funds are more likely to be spent. This move has no impact on your tax rate. So our proposed tax increase for 2015 is currently pegged at 2.42%. Subject to change. It is no secret that most local governments are not satisfied with the lack of any kind of meaningful Mental Health strategy on the part of the Federal Government. The lack of leadership from senior governments means that local governments can either suffer the costs of having people with no access to care living on their streets and filling their police blotters, or local governments can step up and provide the missing programs to allow people with mental illness to live and integrate in our society. I’m new to Council so I can’t take credit, but I am proud of the work this City has done to take the latter approach. From working to find a variety of low-barrier housing options to bringing mental health training to our professional first responders so they can turn a potential conflict into an opportunity for someone to get assistance. There are a couple of projects in the City that are looking like they will be coming to Council for a Public Hearing in April. If the volume of e-mails and letters Council is receiving on these projects is an indication, these will be well-attended public hearings. It is imperative that we allow everyone who wants to speak fair access to the process, but also have regular Council business to get done. Therefore Staff is suggestion we have two separate Public Hearing nights in April as opposed to only one. Hopefully this will allow us to hear more voices and still get home before midnight. Mark your calendars and clear some space on the PVRs, April 20 and 27th will both be Public Hearing nights. Rolling right along on Opportunities to be Heard – Council previously agreed to move forward on a change in our Commercial Vehicle Bylaw to allow four more taxi licenses to be granted in the City. Changing the Bylaw requires a formal Opportunity to be Heard, which is scheduled for March 30, 2015 at our Regular Council Meeting. C’mon out and tell us what you think. This is a 10-townhouse development on vacant land on South Dyke Road. The project has been though community consultation, Design Panel and the Advisory Planning Commission. Council moved to hold an Opportunity to be Heard on the required Zoning Bylaw change on March 23, 2015. C’mon out and tell us what you think. The plans to have a new spray park up and running this summer in Moody Park are, unfortunately, going to have to wait. The complicated job of re-jigging the underground services for the new waterfeatures is going to go into May, and that would mean the park would not be done until September or later, which would put the playground out of service for the busy summer season. Instead, Parks is going to delay the second phase of work until September, so Kids and family can enjoy the park in the summer, and have a spanking new park for spray season 2016. The City’s Purchasing Policy requires staff to report out to Council on the major purchases over the previous fiscal quarter. This is that report. I’m happy to see many jobs were awarded slightly (but not too much) under budget. That means we are doing a pretty good job guessing estimating what capital projects cost, and that we are getting them done on budget. I chair this committee, and am happy that ICBC volunteered to provide a liaison to the committee. So much of what we do at that committee has to do with pedestrian and cyclist safety, and ICBC is such an integral part of how transportation safety is planned in our region (and collects comprehensive stats on what works and what doesn’t), it will be valuable voice at that table. The City has a staff committee who evaluate grant applications for festivals in the City. Staff are better able than Council to evaluate the viability of the proposed events, and to fairly evaluate the in-kind costs to the City of various events. Still, Council gets to decide if the recommendations of that Committee go forward. For the first time in 2015, these grant applications are separate from Community Partnership Grants, and the City has created a mechanism to “pre-approve” the events in up to two subsequent years. This will provide more certainty to the organizers, and allow them to secure longer-term sponsorship and event partnerships, which will hopefully result in bigger festivals in the upcoming years. The City has $175,000 budgeted for festival grants, and we received requests for $273,844. Council agreed with the Committees recommendations and awarded $173,280 in total grants. I wish we could grant all of these events 100%. However, in the spirit of using many hands to make light work, I highly encourage you to contact the organizations and offer a little volunteer time. There is simply no better way to enjoy a Street Fest or a Parade than to actively take part in pulling it off! If you are going to be there anyway- why not volunteer a few hours to help out? In partial relation to the last item, our City Clerk (whose job it is to make sure our meetings are run fairly and in compliance with the applicable legislation) has made a couple of suggestions to make delegations work better. The first is to restrict people from delegating on a topic once a Public Hearing for that topic has been scheduled. We can all think of previous occasions when a contentious project or decision is known to be upcoming, and for weeks leading up to that decision, people delegate to council speaking for or against it. If the project is coming to Public Hearing, it is vitally important that Council not pre-judge the process or argue for or against a project until the Public Hearing is completed. Therefore, if we allow delegations on a topic in the weeks leading up to the Public Hearing, Council cannot address the concerns of the delegate at that time, at risk of violating that impartiality. This in no way limits your ability to speak with council in an open meeting on the topic, nor does it prevent you from calling, e-mailing, writing a letter, or bending a council member’s ear at the grocery store. It does mean, however, that if you want to delegate on a topic going to Public Hearing once the public hearing for the topic is scheduled, you need to do so at that Public Hearing instead of at a regular Council Meeting. It also assures when you do delegate on the topic, Council and Staff will have the correct information on hand to speak to your concerns. The second change is to change the delegation form to allow a delegate to add their contact information right on the form, as often staff are requested to follow up with the delegate, and occasionally, that contact info is hard to get. The City operated tow trucks and a tow yard. Some people question (as with most things) whether it would make more sense for the City to contract that work out. In October (before I was on Council), Council asked staff to perform a financial assessment of Towing Services to determine if the City was indeed getting good value. Turns out the services provide better services at comparable rates to the major towing Service providers used by some other Cities. The service has (since 2011 at least) been revenue-neutral on towing operations, and has resulted in significant saving for the City in that the towing crews, when not actually towing things, have provided a variety of call-out services at no cost to the City, such as snow clearing, pump station or flood monitoring, parking meter maintenance, and assistance at special events emergencies that a towing company simply could and would not provide. So we will be keeping our Towing Services folks around for a while longer. 1: An opportunity for the City to appoint someone to serve on the Metro Vancouver Agricultural Advisory Committee. We don’t have a lot of farms in New West , but we do have a farmer on council, and Councillor Puchmayr was our unanimous nomination. 2: The BC Seniors Games Committee is looking for host Cities for the years 2017, 2018 and 2019. Council asked staff to investigate the details regarding costs and commitments so Council can start the discussion if this is something New West is interested in doing. Finally, we adopted Bylaw no. 7722, 2014. This is the final zoning amendment bylaw required to permit Bosa to start work on their development at 1000 Quayside Drive. This saw first and second reading on September 8 2014, went to public hearing on October 17 2014, and received third reading on the same night. Although I have not been part of the earlier discussions, I think this is a good development concept that has potential to benefit the Quayside area and especially the River Market, by boosting retail opportunities on that side of the tracks. And that was a full day’s work. Posted on February 21, 2015 February 23, 2015 . by Patrick Johnstone. Leave a comment. Walking with Councilors Harper & Puchmayr, Mayor Cote, and MLA Judy Darcy as part of the “Council of Champions” team at the 2015 Coldest Night of the Year walk for Seniors Services Society. Raising funds for a good cause is a little easier on the west cost, where the “Coldest Night” featured a spectacular sunset and flowers blooming along the Quayside boardwalk! Posted on February 21, 2015 February 25, 2015 . by Patrick Johnstone. Leave a comment. Transportation is the #1 issue in this City, and was so during the last election. At that time, this Mayor and the successfully-elected members of Council talked about their vision for addressing this issue, and it centered around implementing the newly-developed Master Transportation Plan. That is the mandate the voters gave us. The MTP contains a variety of goals and strategies, and they are all supported by the plan for transit and transportation infrastructure outlined in the Mayor’s Plan. None of those goals are supported by a NO vote. Further, during the election I was told by citizens at the doorstep, by people in the media (social and no-so-social), and even by other candidates during all-candidates meetings that the City needs to work collaboratively with our neighbours to solve the regional transportation issues that are impacting New Westminster. The Mayor’s Plan that we are being asked to vote on was developed in collaboration with all of the municipalities in Metro Vancouver, and was approved by the vast majority of them. This is what working collaboratively looks like. It might also help is we put that $20,000 into perspective. $20,000 is the cost of a single parking spot. If a YES on this referendum means one more person has access to reliable transit for their daily commute, and the City has to build one less parking spot, we have already broken even. $20,000 is about 0.7% of our annual paving budget. If traffic is reduced by the infrastructure that comes with this plan enough to reduce the wear on our streets by 0.7% for just one year, then the City breaks even. $20,000 is less than it costs to respond and investigate a single road fatality in the City. If one less person in a car, on a bike, or walking, is injured or killed in an MVA in our City because traffic is reduced, or because they now have access to a night bus, or because the Pattullo Bridge is made safer, then the City is financially ahead. 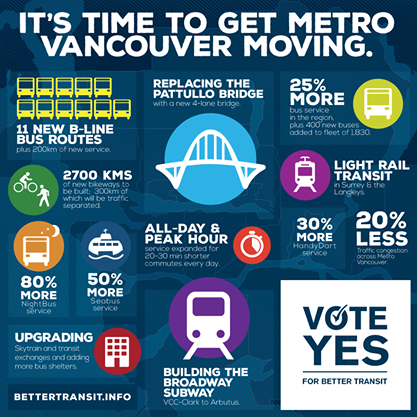 A YES vote will bring hundreds of millions of dollars of infrastructure improvements to the transit and transportation system every person in New Westminster uses every day. $20,000 is a good investment, and we (as elected officials responsible for making good economic decisions for the citizens of New Westminster) would be fools to not support the YES side of this referendum. N.E.X.T. New West at S&O. Posted on February 18, 2015 February 23, 2015 . by Patrick Johnstone. Leave a comment. Hanging with N.E.X.T. New West organizer Tej Kainth in front of a plethora of choice taps. It was a full house at S&O Brewing for a great social and networking event with New Westminster’s movers and shakers. Posted on February 15, 2015 February 25, 2015 . by Patrick Johnstone. Leave a comment. A candidate for Council in 2014 wrote one of those letters to the local paper that I just have to respond to. I know Harm, am a customer of his business, curl with him at the Royal City, and respect him very much. However, this letter is so full of wrong, I need to reply in my customary paragraph-by-paragraph basis. I like to quote people directly, because I don’t want to be accused of misquoting them. However, if I err in fact or in representation, I invite Harm (or anyone else) to reply here. An interesting argument, but not apropos of the current Metro Vancouver Transit and Transportation Plan referendum. Since the Kevin Falcon era, many have been asking for a review of TransLink governance and a return to a more accountable elected board – no-one has called for that more often and vociferously than the Mayors’ Council. However, the Provincial government has made it clear they are not interested in exploring this at this time, and there is no reason to believe a NO vote will bring this about any more than a Yes vote will. I think I made that point in my earlier letter to Mr. Lundy, so I won’t belabour it here. Let’s talk about reserves. If you would like to follow along, you can look at this document from the City website. 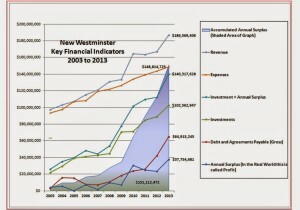 The City of New Westminster has (or had at the end of fiscal 2013) about $15.7 Million in its bank account (“net financial assets”, Page 1 of the Financial Statements). That is derived from subtracting all of the things the City owes money on (invoices in our inbox + revenue we have deferred + money immediately payable on our debts, etc.) from the financial assets of the City (Cash in the bank + money people owe us + the money we have invested, etc.). If you take away the fact we owe people money, and people owe us money, there are two more important numbers when thinking about the amount of money we have on hand. One is the “Cash and cash equivalents”, which was about $12 Million. The other number which kind of represents what we have in the bank is found on Page 8: $102M in Investments. When discussing “reserves”, this is the money we have set aside in various reserve funds, prudently invested and earning us a bit of interest income. 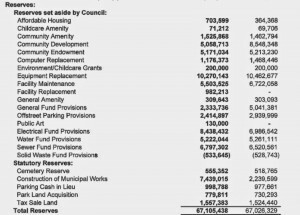 When we talk of “accumulated surplus” (Page 13), that is a different number, but $622M is a bit of a funny number, because it includes the depreciated value of most everything the City owns, including skating arenas, light posts and the furniture in the Mayor’s Office. I guess we could sell it all, but we wouldn’t really have a City anymore, would we? 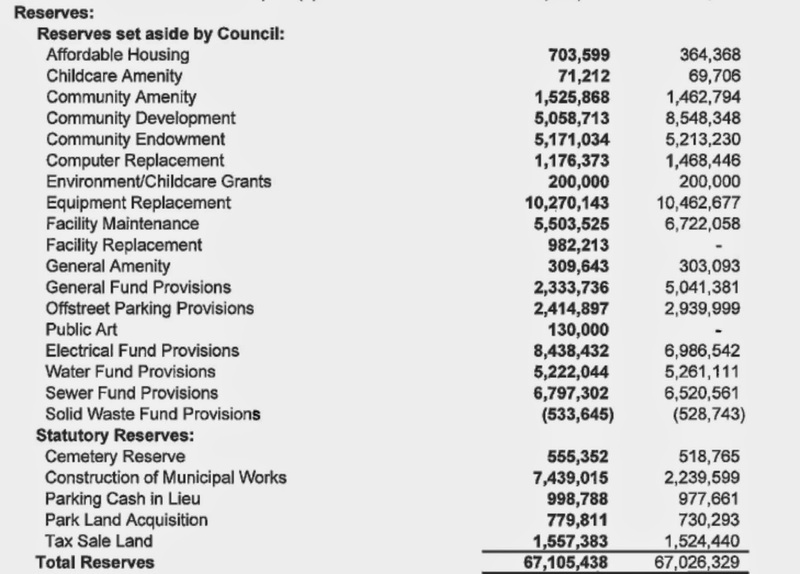 …and see how reserve funds are set aside for everything from Affordable Housing to Equipment Replacement to Water and Sewer funds (I don’t want to get into the whole Tax vs. Utility thing here as this is already too complicated, so for simplicity, assume it is all tax). I’ll come back to this discussion of reserves in a bit below. This sentence is simply false. 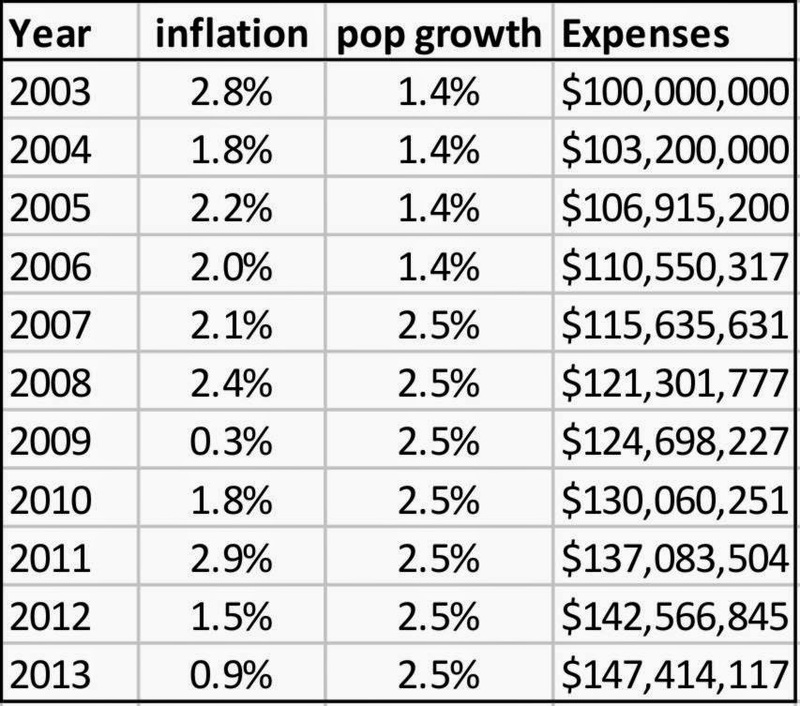 A graph from Woldring’s own website shows how expenses have gone up between 2003 and 2013. 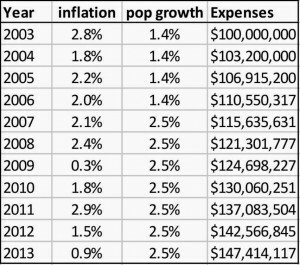 If you want to stop inflation and stop population growth, then we need to have a serious sit-down about Capitalism as an economic model, but this is probably not the right time or place for that. Well, no. What we have here are two levels of government trying to NOT tax at their own level to pay for services that people want. Mayors don’t want to increase your property tax, and the Province doesn’t want to raise your other taxes, but they both agree the project should be funded. Why? Because they are tired of having to explain to people that public services cost money to provide, because every time they say so, Jordan Bateman steps up and calls them all wasteful incompetents, to the cheers of a hundred CKNW phone-in “men on the street”. This letter to the editor is an example of that phenomenon. Far from fattening the coffers, that dividend goes to providing the services people who are living in those developments will need – hence DCCs and expenses going up in parallel to population growth and inflation as seen in the graph above. I ask the simple question: if the 5 cities cited above convert the entirety of their reserve funds, 100% of them, to the 10-year Mayors Plan (which would only provide 47% of the needed funding, so let’s assume the Federal Government matches those funds, and we get this done): Now what? (I’m going to, for the sake of argument, ignore the fact that some of these reserves are Statutory, meaning the Community Charter or other legislation limits our ability to spend them on whatever we want). If we drained our reserve and DCC funds to zero, what would that do to those things listed on Pages 8 and 13 of those financial statements? Money we have earmarked for the Canada Games pool replacement? Gone. Money for the required (and incredibly expensive) storm drainage separation project? Gone. Future electrical utility maintenance and upgrades? Money to re-build Massey Theatre? Future support for daycare, affordable housing, roof replacements on City buildings? Money set aside for future fleet vehicle replacements, computers, the cemetery reserve, or paving of roads? All of it gone. How does that serve the taxpayer? The letter invokes a picture of City hall having this big vault in the back where Mayor and Council occasionally roll around in piles of cash, all for shits and giggles. In reality, consecutive Councils have created and supported a long-term financial plan that will provide for the ever-increasing needs of the community (a problem made worse by downloading of so many senior government coasts to local governments) while assuring that future councils have the capital required for the huge pile of inevitable big-ticket items the City will need in the future without the sudden need for sharp tax increases whenever a capital project is needed. It is responsible governance. This is hardly a PS. This is the central point. But I’ve been banging that drum for so long I’m tired of the rhythm. *My turn for a PS: This is a good time to have the discussion about the City’s reserves, not because they would be better served bailing out the Province from their responsibility toward TransLink, but because we are going into a budgeting cycle in the City where Council may ask taxpayers for yet another increase, and some of the money that increase will bring in will go towards reserves. The letter writer clearly believes these reserves are getting too big, I have talked to a Charted Accountant who has some experience in Municipal finance, and (after a cursory review of our 2013 Financial Statements, and admitting he didn’t know much about the pressure on New Westminster’s physical resources) he suggested they were moderate, or perhaps a bit low, and he is not alone in that feeling. We need serious talk about reserves and how we use them, for the long-term good of the City. Posted on February 14, 2015 February 23, 2015 . by Patrick Johnstone. Leave a comment. Meeting “Happy City” author and urban visionary Charles Montgomery. He gave an inspiring talk to launch the City’s OCP public consultation process. In summary: Your city can, and should, make you happy. Posted on February 13, 2015 February 23, 2015 . by Patrick Johnstone. Leave a comment. Impressing NDP Deputy Leader Megan Leslie with my selfie-double-chin. Posted on February 10, 2015 February 23, 2015 . by Patrick Johnstone. Leave a comment. Royal City Farmers Market 2015 AGM at the Beautiful Fraser River Discovery Centre, with RCFM President Kevin McConnell. Posted on February 10, 2015 February 25, 2015 . by Patrick Johnstone. Leave a comment. For the first time in my short tenure on Council, we had one of those big development decisions that brought some public comment, most of it negative. So it is worth the time to go over how I viewed the request, to address some of the community concerns, and to explain why I voted the way I did. The question on the table for Council was whether we approved the Development Permit (DP) for the next phase of the Brewery District, which includes the first residential tower and a significant number of community amenities. Earlier development phases brought the office and commercial space where TransLink offices, Save-on-Foods, Browns Social house and other retail spaces, and the Health Sciences Association offices are currently housed. There are several phases of primarily residential development coming over the next decade or so. DP is the stage in the approval process where the “form and character” of the buildings are reviewed to see if they align with the applicable Zoning Bylaw and Official Community Plan, and whether variances from these bylaws are required to meet the goals of the Developer. In theory, the City has a lot of power at this stage to adapt the building size and shape, design elements, landscaping, and such. In practice, if the City wants a lot developed it needs to negotiate with the builder and balance what the City wants (i.e. the word and/or spirit of the OCP), what the community wants (as determined through public consultation), and what the builder is willing to invest in building (they wouldn’t be here if they didn’t want to make money). Never are all three of those things exactly aligned. That is why we have planning staff, and why the process sometimes takes months or years. In the case of this Phase 3 of the Brewery District, the applicable Zoning Bylaw was developed in 2006 and passed in 2007. At the time, there was extensive public consultation, and several iterations of earlier designs were offered. The City’s primary interest (I was not, obviously, on Council at the time, but can infer from going through the old reports) was in seeing the old brewery replaced with (commercial) employment lands, while the site owner clearly wanted to build as many condos as they could sell. The community’s main concern was that the tallest building proposed was to be over 300 feet tall, which some felt was out of scale for Sapperton. As the final “form and character” issues would be delayed until DP, the City and the developer found agreement on the density of the site (i.e. number of square feet of Commercial and Residential), the phasing of the build-out (commercial first), and the maximum heights of the buildings (180’ for the lower three, up to 300’ for the higher one). The City also agreed to permit the developer to shift density between buildings to accommodate community concerns. I went back through those 2007 documents, and there was nothing unclear about the Zoning as passed – Phase 3 had a 180’ maximum building height, Phase 4 a 300’ maximum height. Although there were concerns raised by some residents at the time, the Council of the time saw the community benefit of that density, and the promise of jobs and retail that came with it. Building >180,000 square feet of commercial/retail space surrounded by residential buildings essentially on top of an existing SkyTrain station aligns well with the Regional Growth Strategy and the City’s own long-term planning. The building being presented right now required no variances from the existing zoning Bylaw, and fit both the spirit and the letter of the agreement made between Wesgroup and the City back in 2009. To turn down this DP at this point would demonstrate very bad faith on the part of the City, in my opinion. That said, there were some concerns expressed by a few members of the Sapperton community. I will attempt to address the main concerns, recognizing I am not going to make the people holding these concerns happy, but as a new and idealistic public representative, I figure people deserve direct answers. The McBride Sapperton Residents Association wrote a letter to Council on the issue. In the letter, the MSRA opposed the height of the building, and requested a reduction in the height, although their preferred height was not made clear, nor did they make clear if they would accept a widening of the building into the view corridor (i.e. would they be satisfied with a shorter, wider building, as the Zoning Bylaw would allow, or did they want the City to change the Zoning Bylaw and reduce overall density at this late stage?). A small number of people raised concern to Council about the higher density of this development, and question whether that fits the “character” of the Sapperton neighbourhood. The problem with this argument is that we are trying to call back a ship that sailed long ago. The density represented by this building is exactly in line with the 2007 rezoning, and the public consultation and City desires at the time were to develop density necessary to assure retail success in the block. Looking back at the consultation from the time, the “overall density” argument was not prominent, it was the maximum height issue (at over 300′), which provided for the density shifts we are seeing now. Re-opening that discussion 8 years later, after the developer has built the employment lands on the site, is not good faith in my opinion. I would argue that when it comes to this development, the more density we can stick on it and still provide essential services, the better it serves the City’s Official Community Plan, the Regional Growth Strategy, and the better it protects nearby residential neighbourhoods. This site is immediately adjacent to a SkyTrain Station and the largest single employer in New Westminster. The way it has developed, it will be the anchoring retail district of Sapperton. The first principle of Smart Growth (upon which the Regional Growth Strategy is built) is to allow people to travel less by putting everything they need close together. This will allow the critical mass of density we need to support a vibrant retail/commercial mix without expanding density increases into the single-family neighbourhoods of Sapperton. Yes, it means that your single family house (like mine) might now be located within a block of a 16-story tower (like mine is), and it will require that the City allocate more of the resources this increased density allows towards providing the infrastructure and amenities needed to support more people. This brings me to the traffic impact issue, which is one that resonated the most with me. There will be traffic impacts of this development, no doubt. Most of the ~200 people who will live in this building and the ~1000 total who will live in the Brewery District by the time the development is completed, will own a car. Many of them will use it on a daily basis. There will be local impacts of this increased traffic. No debate there. The City will do what it can to mitigate those impacts so that every resident of the City (new and old) can get around as easily as possible, and the livability of our residential neighbourhoods is protected. I think that a neighbourhood traffic plan for Sapperton is due, and will be done before this tower is complete. That said, traffic is a regional issue. New Westminster produces the least traffic per capita of any City in the lower mainland, something like 26,000 daily trips in total, yet suffers under the load of 400,000+ (depending on whom you ask) through-trips every day. 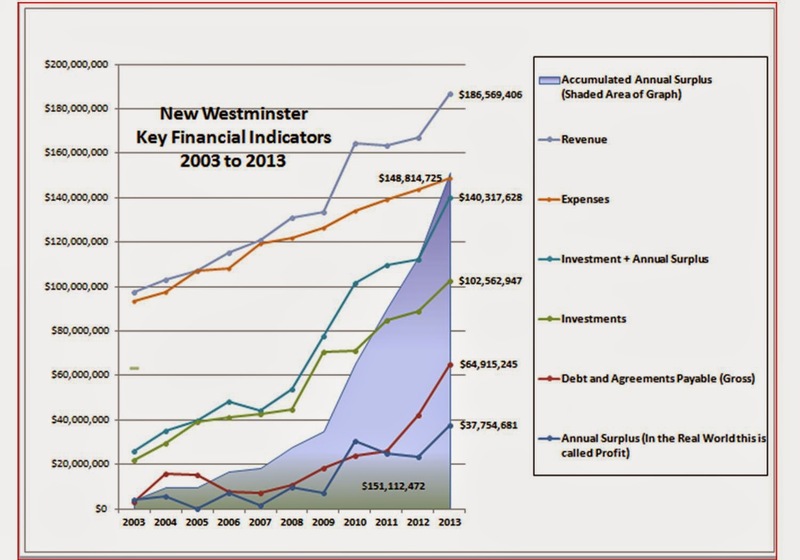 As a regional partner, New Westminster is not just doing its part, it is leading the way. Developments like the Brewery District are part of the regional Smart Growth solution, and are a demonstration of our leadership. Not everyone in this tower is going to ride the SkyTrain or walk to RCH every day, but the proportion of them who do use those options will be way higher than in lower-density developments away from reliable and frequent transit service that are the alternative. When people accuse New Westminster of being parochial about traffic, or of not allowing freeways to be built through our residential neighbourhoods, it is developments like the Brewery District, Plaza 88, and (let’s hope) Sapperton Green that are our best counter-argument. We are developing our City in alignment with regional growth and transportation plans. So, yes. I voted in favour of this Development Permit, because it met the spirit and letter of the 2007 Zoning Bylaw without any variances; because density immediately adjacent to a SkyTrain station represents the development goals of the City and the region and represents the best hope we have to preserve the livability of our residential neighbourhoods; and because we cannot forget the regional transportation picture when addressing local traffic issues. *Disclosure #1: My Campaign disclosure forms are on their way to the province right now for vetting, but I should disclose that Wesgroup, the developer of the Brewery District, donated $750 to my campaign. ** Disclosure #2: This links to a blog post by Brad Cavanagh a Sapperton resident who I know socially, and who is doing the best job of out-NWimbying me right now with his sharply worded and well-researched blog. He’s like me, but smarter with a better editor. Posted on February 6, 2015 February 25, 2015 . by Patrick Johnstone. Leave a comment. It’s been a crazy busy two weeks, I hope to be able to blog about some of it soon, as I went to a couple of events, and Council had a great Strategic Planning session. I also will have really cool website news coming up. But you will have to hold fast with my report of the fifth official Council meeting of the term which occurred on February 2nd. After Presentations and Open Delegations, the meeting usually starts with Recommendations from the Committee of the Whole from the afternoon. However as many of the open delegations were there to talk on the Brewery District issue, the Mayor moved that item up in the agenda to immediately follow the delegations, as a courtesy to the delegates (you can watch the video here). This is, of course, the first residential building in the Brewery District development. This will be a 15-story tower on top of a 2-story platform (which will be at underground when seen from the elevation of the Columbia Street side, but a tall 2 stories on the Brunette Ave side). I voted for this DP, and the Council unanimously supported it. There was some community opposition, so I think I will save the longer discussion of this project for another blog post (in the next couple of days). Stay tuned! Many of the City’s Advisory Committees have spots reserved for representatives from external agencies, such as Residents’ Associations, the Royal Westminster Regiment, and Fraser Health. Some of these appointments were later than the regular appointment schedule. So who is Council to say no? This is the first time Council has had a chance to look at the updated financial plan, so there is much more to come on this in the upcoming month or so. The Staff proposal showed us two potential paths: maintaining the status quo as far as program delivery and the existing longer-term capital plan, which would result in a property tax increase of 2.75%; or increasing program spending in a few very specific places where they are needed to meet citizens’ expectations, which would result in an increase of 3.45%. I have not had as much chance as I would like to dig through the financial documents, although the longer discussion we had in Committee of the Whole did clarify things quite a bit. There will be a fuller discussion, and the public will have a chance to tell Council what they think about the bigger budget picture before this update of the financial plan (and any subsequent tax increase) is formally adopted – discussion will ensue. One thing I want to make clear is what a 3% tax increase means. It doesn’t necessarily mean you will pay 3% more than you did last year, although it will be pretty close to that. What it means is that the total amount of money the City receives fro mall taxpayers increases by 3% over last year. I gave a bit of an explanation of Mil Rates here a couple of years ago, but I’ll repeat the basic idea here in a very simplistic way. Let’s pretend you owned a $100,000 house in New Westminster in 2014, and the City’s “mil rate” for taxes was 3. In that case, you would have paid $300 in taxes. If the City wants to raise taxes 3%, your mill rate will go up by 3% of 3, to 3.09 and you would pay $309 in taxes. But what if, in the same year, property values across the City went up by 5%? The City would still need 3% more to balance its budget, but to get $309 out of your now-$105,000 house, the actual mill rate would go down to 2.94. The fun part is what happens if, in the year that average city-wide property values go up 5%, your house doesn’t go up at all, but your neighbour’s house goes up by 10%. That 2.94 mill rate means you pay $294 in taxes (a 2% decrease) while your neighbor pays $323 (a 7.5% increase). There are a few other little intricacies. One point to think about is that new properties (for example, the first time a high rise starts paying full property tax on the residential properties, not the abandoned gravel lot it was before) means new taxes, which eats away at that 3%. This is a big reason why a City like Surrey, where new houses are popping up out of the forest every day, can have low Mil Rates – a lot of the annual tax increase required to provide the services people want comes from new lands paying taxes for the first time. Anyway, this is the start of the discussion – Council has not decided on what the tax increase will be next year. My cursory look at the numbers suggests something very close to 3%, but lots of discussion to come before any kind of decision is made. The Q2Q pedestrian bridge between the Quayside and Queensborough is moving forward. Council is very supportive of this plan, the majority of the money is in place. We are looking at Grants and other opportunities to top up the fund. The City is also working with stakeholders (Southern Railway, Marine Carriers, Port Metro Vancouver, etc.). The Bascule Bridge design was clearly preferred in public consultations, which is fortunate, because it was also the preferred design from the parallel process evaluating the technical aspects of the project. The benefits of the low-bascule design Benefit of this bridge are many- low visual impact, the preferred location does not impact the Submarine Park, it is safer location from a ship allision risk (“allision” is the nautical term for when a mobile object like a barge runs into a non-mobile object like a pier, when two mobile things collide, it is called a collision. (learn something new every day). This option will also allow the bridge to be useable as an emergency crossing for safety vehicles, to being able to carry an ambulance and/or police vehicle. The bridge is coming. There are a lot of hoops to jump through yet, but some time in 2017 or 2018, Quayside residents will be able to take a short stroll over to Frankie G’s. Two Taxi Companies are licensed to operate in New Westminster, and both of them have applied for more licenses. The provincial agency that regulates taxis did not give them all of the new licenses they wanted (a combined 17 more licenses), but instead gave them two each. The regulation requires that the City also approve these license, and because that takes a Bylaw change, we need tot go through a public process to change the bylaw. This reflects back at how an amazingly high pile of regulations exist around taxis. The number of cars, the types of cars, the rates they may charge, even where taxis can pick up or drop fares, is regulated. In the world of Uber and the internet-enabled sharing economy, this is a situation that will be coming to a head in the next few years. It will be an interesting file to watch develop. This building project is the first of two going on that will re-shape New Westminster Station. Building the cover that will keep the platform level dry will make for a more comfortable environment for the retailers and passengers. TransLink is talking about some significant changes to the station as well, including replacing a lot of metal mesh with glass and updating the elevators and escalators. All good stuff. Unfortunately, working around the SkyTrain means working around the heavily trafficked transit times, which means much of the construction must happen in the middle of the night. It is a bit disappointing that this project has been so delayed that they need to come back to the City for an extended noise variance, but it sounds like they are doing a good job addressing issues that arise, and the end will be soon! We talked last meeting about the Our City visioning event coming up in mid-February, and approved the Visioning Advisory Group volunteers. However, since we discussed it last, two more Residents Associations have nominated representatives. So who is Council to say no? This is a rezoning for a new single-family home in Queensborough. The rezoning is generally aligned with the goals of the recently-developed Queensborough Neighbourhood Plan. This report is to get the rezoning process started, as community consultation, committee and staff review have yet to take place, so I’ll reserve comment for this time. The west half of the Parkade is coming down in 2015, and a newly-designed Front Street between Begbie and 6th Streets is being designed. As much as I wish the east half of the Parkade was going as well, the Downtown Parking Study and community consultation have made the case for investing in necessary repairs of the East Parkade, so we will be keeping it for a few decades yet. Those repairs are going to come with some significant upgrades, including replacing the no-longer-conforming railing with a screen and mural design. This is a multi-phased project, and will have profound effects on the waterfront the New Westminster. In this report, staff is outlining the project schedule, and a detailed public consultation process combined with a comprehensive business support plan to help the building owners and small businesses along Front Street weather the storm (always keeping in mind that after that storm, the sun will finally shine on Front Street, for the first time in 50 years). I to frequent a few of the businesses down there ,and yes, they are concerned what a 3-month long demolition project, followed by another 3-month road construction project, will do to their businesses. I’m hoping the City, the BIA and the businesses on Front Street can work together to mitigate the disruption. As a New Westminster resident, you can help by spending a bit of time and money down on Front Street overt the next year, and help our small business community out. 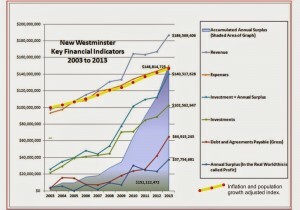 The fixing of the east half will occur through 2015, and will be mostly complete before the removal of the West Parkade, which should occur in the fourth quarter of 2015. The re-forming of Front Street will occur in early 2016. This is an exciting new project the City is spearheading. Using our existing road and electrical infrastructure, the City is going to install “Dark Fibre” such that 1GB “Broadband” service will be available for most businesses and many residential areas of the City. This is a huge economic opportunity for the City, and will provide us one of the missing pieces for the development of a real knowledge-based economy sector in the City. I want to expand on this in a future blog post (and clarify the stretched allegory I tried to develop during the Council Meeting), so stay tuned, and I will try to pump something out this week. The City has about $100 Million in the bank. It isn’t all cash – we can’t just draw it out and build a new swimming pool with it. Much of it is already earmarked for various purposes. Some represent money put into reserves for some utilities – i.e. a small portion of your water bill goes in to a reserve fun to build new water pipes when they meet the end of their life. Some are Development Cost Charges – fees we collect from developers when they put in new building to fund necessary infrastructure improvements that will be required by the new population they are building houses for. For a variety of reasons, the City builds up these reserves, and we spend them when the time is right. While sitting on them, however, we collect interest, and the funds are invested in a larger fund called the Municipal Finance Authority. Because of the size of the fund and the great management of the funds, we make pretty good returns. In many cases, we make more money from the interest on these funds than we pay in interest on some of the loans we take out to fund other projects. I’m simplifying things a bit, but this report shows our reserves are doing pretty well as far as a managed investment. Deciding how we are going to manage our reserves in the long-term is part of the bigger discussion around the annual Financial Update that I alluded to above. People have been converting garages and sheds into living space. That is a problem. It violates zoning laws, has impacts on neighourhoods, and allows people to cheat on property taxes and utilities. Increasingly, these conversions are done without proper permits, meaning that the places where people are living may not meet building codes, which could actually threaten the lives and health of the people living in these spaces. One way to get around the permitting process is to “rough in” plumbing to an accessory building, but not install it. Once the inspections are done, and the building is signed off, you illegally install the plumbing features that attach to those roughed-in pipes, and attached the kitchen and bathroom fixtures. A little bit of drywall and some shelves, and all of the sudden you have a rentable suite. Most cities limit the type of plumbing you can put in an accessory building to avoid this problem, staff recommended we do so as well. If you have a garage with a workshop in it, you will still be able to have a sink, or a small bathroom (without a shower), but you will not be able to have multiple sinks, and a bathtub, essentially making it much harder to install a kitchen and bathroom in these buildings. As a side note, the issue of Laneway Housing will be a part of the OCP process- there are some nieghbourhoods and locations where laneway houses may make sense in the New Westminster, and the OCP process and adaptable Zoning is the way to get there, not the building of illegal suites in the hope that the City will let them get by. Frankly, as a City councilor and a Municipal Employee, I have no tolerance for people who flaunt building codes and zoning. Fundamentally, it isn’t fair to the neighbours, and hurts the livability of the City. Finally, the new Mayor is making further adjustments to streamline how Council operates. We are looking at reducing the work we do in “Committee in the Whole” when that work can more easily take place in the evening meeting. Part of the plan is to open up Committee of the Whole time to allow for more detailed issue-oriented “workshops”. There will mostly still be open meetings of Council (unless we are working on topics that need to be in camera), but will allow us, as a Council, to dig down deeper into specific initiatives or topics, in the interest of moving those things forward more quickly. So some adjustment of the Council Schedule has to take place to make that happen. And that is it for Groundhog day. I have two topic above I hope to get blogs out on before we meet again in mid-February. Enjoy Family Day everyone!